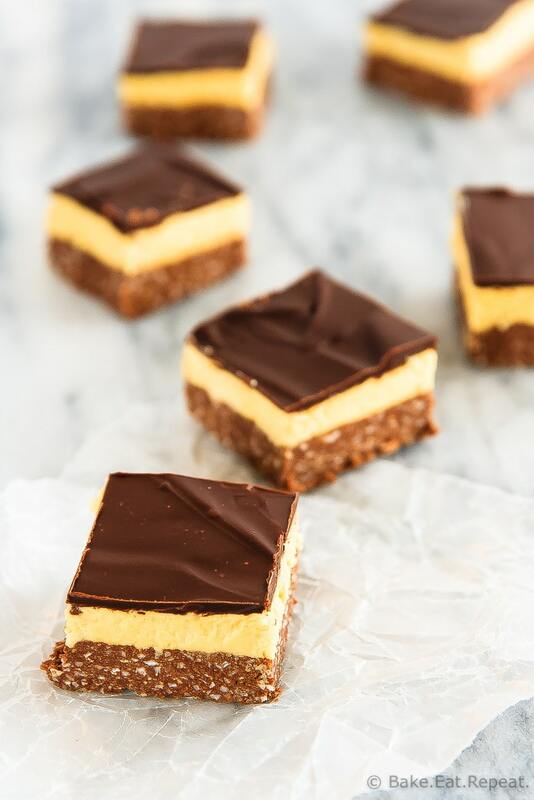 These are the absolute best nanaimo bars, an amazing, no bake treat that’s a perfect addition to your holiday dessert table! Have you ever had a nanaimo bar? When I originally posted this recipe almost two years ago, I discovered that they’re actually a Canadian thing and many, many people have never heard of them, let alone tried them. Now, clearly I should have known this was a Canadian treat. They’re named after a city that I visit every. single. summer. This should have been obvious to me. For some reason I just thought this was a strange coincidence. I can’t even believe that I’m admitting that because I feel just slightly ridiculous for not knowing. I guess I just can’t imagine anyone not knowing about these little treats. How does everyone not know and love nanaimo bars? They’re too amazing to only be a thing in Canada! Nanaimo bars have always been a favourite of mine. When they were on the dessert table at a buffet, there was no question about what to choose. But the first time I remember having an absolutely amazing one was the first year that I spent Christmas with my husbands family. My mother-in-law makes the best nanaimo bars. That’s just a fact. Nanaimo bars were actually not a dessert that I considered a Christmas treat until I was married. Although I’m certainly on board with that little tradition. The best part about making them every year at Christmas is that I’m no longer too tempted by them when I see them at restaurants. They’re always a bit disappointing. These are the best, so why bother with any others? They are also so simple to make. It takes minutes to make each layer, and there is no baking required. Mix a few things together, spread it in the pan and chill. Repeat. That’s all you do for these. They’re pretty, they’re easy to make and they’re so delicious. That’s a perfect Christmas treat in my opinion. 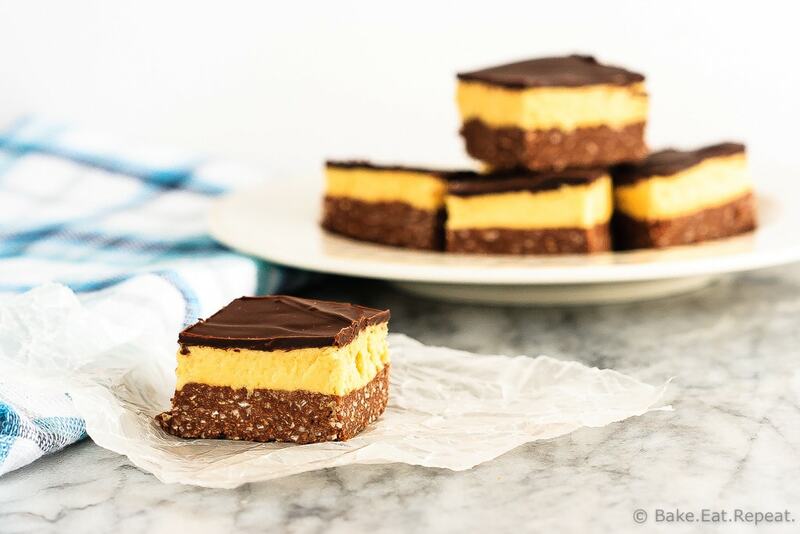 If you love nanaimo bars, you need to try these. And if you’ve never tried one – you most definitely need to make these this Christmas. They shouldn’t be just a Canadian thing, they’re far too good for that. These are the absolute best nanaimo bars, an amazing sweet treat that's a perfect addition to your holiday dessert table! Place the 2 ounces of chocolate in a medium microwave safe bowl and microwave for 2-3 minutes at 50% power, stirring every 30 seconds, until the chocolate is almost melted. Continue to stir until it is completely melted. Add the butter, granulated sugar, vanilla, egg whites, graham wafer crumbs and unsweetened coconut and mix well. Press into a 9x13 inch pan and chill for 20 minutes. In another bowl, cream the butter for the filling. Add the custard powder, powdered sugar, milk and vanilla and beat with an electric mixer until smooth. Spread the filling evenly over the chilled base. Chill for another 15-20 minutes. In a microwave safe bowl, place the 4 ounces semi-sweet chocolate and the butter and heat at 50% power for 2-3 minutes, stirring every 30 seconds until the chocolate is almost melted. Continue stirring until it is completely melted. Spread evenly over the chilled custard layer. Chill for several hours or overnight. Cut into bars and store covered in the refrigerator for a week, or remove from the pan and freeze in an airtight container for up to 3 months. I actually prefer these just slightly thawed straight from the freezer! I’ve used both unsalted and salted butter for these and both are fine, so use your preference. I use baking chocolate for both the base and the glaze. You could certainly use chocolate chips instead, but I wouldn’t recommend it as they don’t melt as well as the baking chocolate. Source: Slightly adapted from my mother-in-laws recipe. I use pasteurized egg whites rather than a whole egg for the base. Hello, I’m looking to make these delicious bars soon for a potluck. I had a question: adding custard powder to the buttercream without cooking sounds a bit odd to me. Can it be cooked in anyway before adding to the buttercream? Or it doesn’t matter? I've never cooked it in any way so I wouldn't do that - it's definitely not necessary to cook it! That's the best part of these bars, no cooking or baking at all - hope you enjoy them! I made these and they're lovely. Just a little meltey at room temperature. This is probably a normal nanaimo thing, but I need to make them for a potluck and they'll be out of the fridge for an hour and a half to two hours. Any suggestions for how to make them a little firmer at room temperature? Thanks! Hi Abby - they DO get a little melty at room temp after a bit. I find they last a little longer if you freeze them first - you can eat them straight from the freezer as they don't get too terribly hard (I actually prefer them frozen! ), and they will last a bit longer before they start getting really soft at room temperature. If you add 1 cup of chopped nuts to the base you will get the proper consistency. I add that to my recipe. I made these yesterday and they are amazing.I never heard of custard powder before until I read this recipe.I couldn't find it at any stores here in the Milwaukee,Wi. area,so I looked and found some at the Walmart website.A 10.6 ounce box of Bird's custard powder for 6.99 and free shipping.The only thing I did different from the recipe was to not add all the powdered sugar.I added 3 cups instead of 4,and I think the next time I will only add 2-2 1/2 cups.I don't like too much powdered sugar in recipes.I have never heard of nanaimo bars before,but I am glad I tried them.This recipe is a keeper.I will be taking them to the Christmas get together today and see what others think of them.Thanks for this recipe. I'm so glad you liked them! They're a Canadian thing, which is probably why you've never heard of them, but I make them every year at Christmas time. They're a favourite! I'm in NZ and I'm sure I've seen these but with a different name in bakeries... Either way they have everything good in them so no wonder they made the journey here! These are excellent! My husband is very picky when it comes to Nanaimo bars because they are his favorite dessert. However, he says this one has the perfect ratio of base, filling, topping. He's actually said these are the best he's ever had! Everyone is always wow-ed with how glassy the top layer looks too! The only thing I changed was baking the base at 350 for about 8 minutes. The raw egg thing always weirds me out! Excellent. Thank you so much for sharing. You're recipe definitely looks worth a try. Yes, Nanaimo bars are Canadian (Nanaimo is off the coast of BC) and I believe up until recently you couldn't actually purchase custard powder in the US. I use cocoa in my base layer but look forward to trying your version. Thanks Andrea! Actually it's funny, my in laws actually live a half hour from Nanaimo, so I've been there many times, just never realized that that was actually where they originated! I didn't know that you couldn't get custard powder in the States though, usually it's the other way around when it comes to not being able to get something! Hope you enjoy this version! Nanaimo is located on Vancouver Island(so is Victoria, British Columbia`s capital city) not located "off the coast of B.C." Just wanted to let you know in case you visit there sometime. It`s a beautiful place. I had trouble when I made these before because when I cut them, the chocolate had hardened and they would crack and not cut into nice bar shapes. Is there a trick to cutting them? I just let them sit on the counter for about 10 minutes before cutting them so the chocolate isn't quite so cold. And then I dip the knife in hot water before each cut which seems to work well. There were a couple in the corners of the pan that cracked a little, but most were fine. It's a fairly thin layer of chocolate in this recipe too, which isn't the case for all nanaimo bar recipes. And cut slow! These look fabulous Stacey! I've never had nanaimo bars before, but I wish I get to try one soon! I'm totally a coconut-kinda gal, and these gorgeous bars are checking off all the yum factors in my mind! Absolutely gorgeous photos! --- so festive. :) Pinned! Thanks Sarah! The coconut just might be my favourite part. Or the chocolate. Or just all of it. :) Thanks for the pin! I've (sadly) never had a nanaimo bar. But that has to change! These look pretty perfect to me. That does need to change Joanne! They're so good! Thanks! Hi Sasha, the original recipe calls for one whole egg instead of 4 tablespoons of pasteurized egg whites. I changed it to avoid having raw, unpasteurized egg in the bars as they aren't baked. I've eaten them both ways though and can't tell a difference! If you say they're the best, I believe you! They certainly look like the best ones I've seen. Haven't had these in a while, but now I'm inspired! Wow do these look amazing or what?!? I have never heard of nanaimo bars but I will definitely be tryimg them asap! Thanks Kelley! That seems to be a common theme! They must be a Canadian thing, who knew?! Let me know if you try them! I've never heard of nanaimo bars myself but after reading your post, I'm sold! I like coconut too but for those who don't...I wonder if you could substitute some crisped rice and make it taste like a gourmet Nestle Crunch Bar? Thanks for sharing! Thanks Jim! Crisped rice would be an okay substitution, but I don't think it could be called a nanaimo bar then, the coconut is a pretty integral flavour in them! But it would be tasty I'm sure! To make them coconut free though, I might be more inclined to just increase the graham crumbs, then the texture would still be the same, although the flavour would be different. Maybe I'll have to make them that way some time and see! I agree -- I love coconut in anything! And Nanaimo bars are definitely an all-year treat in this house! One of my FAVORITE bars! They're so good right?! I haven't actually made them anytime but Christmas in years, but I certainly wouldn't say no to one anytime of year! These bars look delicious. I'm definitely pinning these. Thanks Chineka! And thanks for the pin! I absolutely love Nanaimo bars and yours look perfect, Stacey! I can't wait to try them out! Pinning! I have never heard of a Nanaimo bar! Obviously I am missing out because those layers are AMAZING! Wow! You definitely are! They're the best! Thanks Annie! 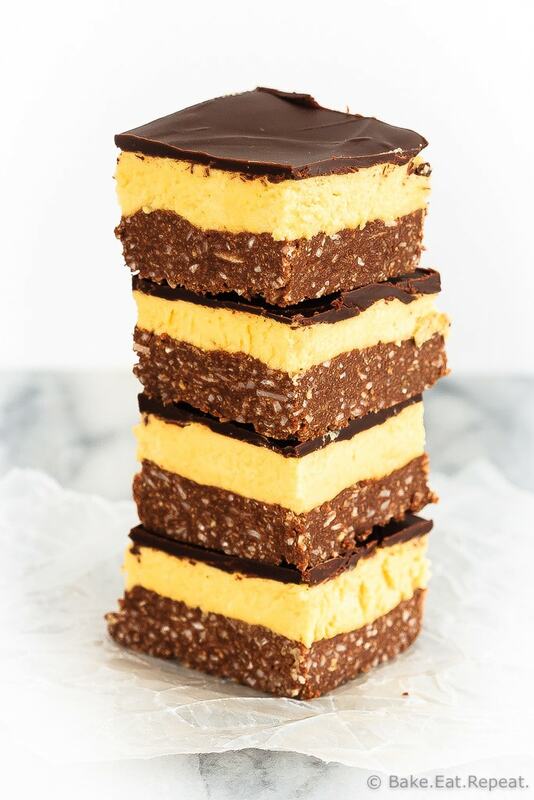 LOVE Nanaimo bars, these look absolutely amazing Stacey! Merry Christmas! Thanks Jess! Merry Christmas to you too! You go girl! I like your conviction! And you've definitely convinced me!! I've never even heard of these but now I can't wait to try them!! Thanks Annie! You're the third person to say you haven't heard of them, so I'm guessing they're a Canadian thing! I had no idea. You guys have been missing out then, cause they're amazing! Thanks Mira! They're amazing - hope you get the chance to try them! To be honest, I've never heard of a nanaimo bar before, Stacey! But I'm loving the looks of these! The filling sounds delicious! I've never used custard powder before, is that similar to a pudding mix? These bars look chewy and so full of flavor, especially with the chocolate on top! Really? Are they a Canadian thing? I didn't know that! I actually just went and looked at the custard powder can so I could tell you what it is! It's basically cornstarch and flavouring, so not really like pudding mix I don't think. It's just sold in the baking aisle, the one I use is Bird's Custard Powder, made by Kraft, I would imagine it's in the US too. It'd be weird if we had something you didn't! It's main use would be for making custard, but I've only ever used it for nanaimo bars. The base is pretty chewy, basically chocolate and coconut, and the middle is a similar consistency to frosting, but tastes more like custard. I love these, if you can find custard powder you should definitely try them!